Since 10 April 1933, Italy had enjoyed ownership of the 3 km absolute world speed record for aircraft. Warrant Officer Francesco Agello set the record at 423.824 mph (682.078 km/h) in the Macchi-Castodi MC.72 seaplane built for the Schneider Trophy Contest. The MC.72 was powered by a 24-cyllinder FIAT AS.6 engine. Agello went on to raise the record to 440.682 mph (709.209 km/h) on 23 October 1934 in another MC.72. 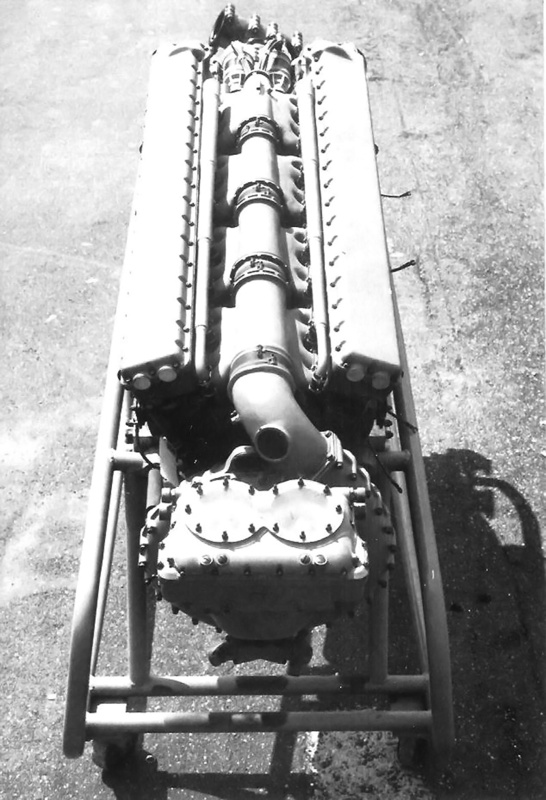 Side view of the FIAT AS.8 V-16 engine specifically designed for the CMASA CS.15 racer. However, Germany captured the world speed record on 30 March 1939, when Hans Dieterle flew 463.919 mph (746.606 km/h) in the Heinkel He 100 (V8). Germany raised the record a month later on 26 April 1939, when Fritz Wendel traveled 469.221 mph (755.138 km/h) in the Messerschmitt Me 209 (V1). Even before Dieterle’s record flight, the Italians had considered building an aircraft specifically for a new record attempt. FIAT, with the support of the Italian government, wanted to win the record back and had initiated an aircraft and engine design that was somewhat finalized before Wendel’s record flight. The new record aircraft was designed and built by Costruzioni Meccaniche Aeronautiche SA (CMASA), a FIAT subsidiary in Pisa. The engine would be designed and built at FIAT’s headquarters in Turin. A rear view of the FIAT AS.8 showing the valley between the engine’s banks. The small manifolds on each bank are to take the cooling water from the cylinders. They are installed backward in this photo; the outlet should be at the engine’s rear. 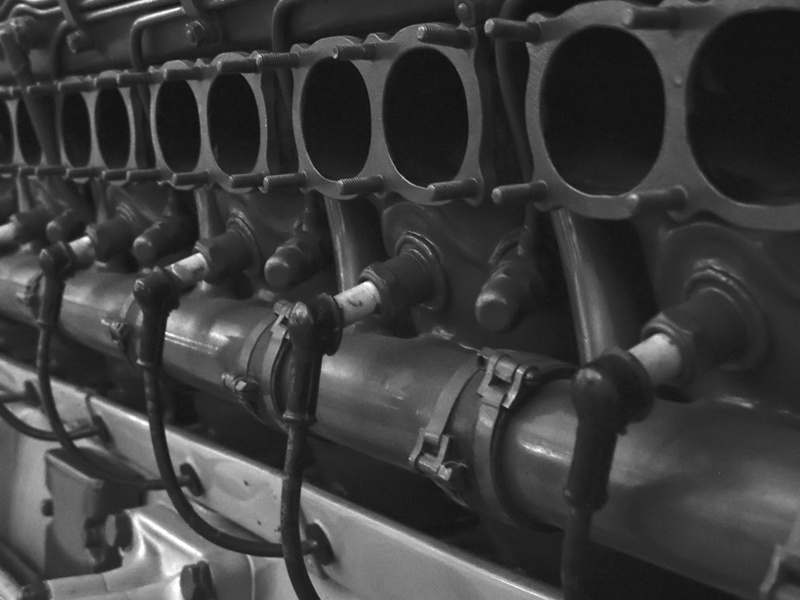 The long intake manifold is reminiscent of the even-longer manifold used on the AS.6. The large port in the manifold elbow, seen just above the carburetor, is a relief valve to prevent over pressurization of the manifold (perhaps in the event of a backfire—a major issue in the early development of the AS.6). The aircraft was designed by Manlio Stiavelli and was known as the Corsa (meaning Race) Stiavelli 15, or just CS.15. Lucio Lazzarino, an engineer at CMASA, analyzed and tested various aspects of the CS.15 design. The CS.15 was a small, mid-wing, all-metal aircraft with a very low frontal area. Its 29.5 ft (9.0 m) monospar wing had conventional flaps and ailerons. The cockpit was situated far aft on the 29.2 ft (8.91 m) fuselage and was faired into the long tail. To keep the wing thin and the fuselage narrow, the main wheels of the CS.15 folded toward each other before retracting aft into the fuselage. The CS.15’s fuel tank was situated behind the engine, in front of the cockpit, and above the main landing gear well. Fuel capacity was very limited, and the CS.15 was only meant to have enough endurance to capture the speed record—about 30 minutes of flight time. The estimated empty weight of the CS.15 was 4,213 lb (1,910) kg, and its total weight was 5,000 lb (2,270 kg). To power the CS.15, Antonio Fessia and Carlo Bona laid out the AS.8 (Aviazione Spinto 8) engine design at FIAT. The AS.8 was a completely new design but had many common elements with the AS.6 engine used in the MC.72. The AS.6 was designed by Tranquillo Zerbi, and Fessia had taken over Zerbi’s position at FIAT when he passed away on 10 March 1939. 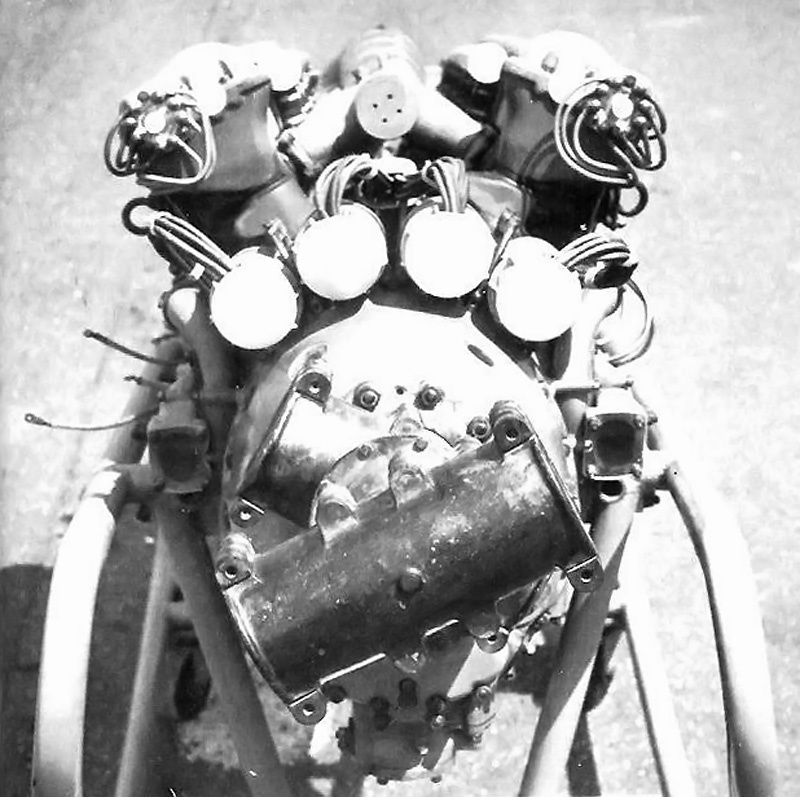 The AS.8 was a liquid-cooled engine with cylinders very similar to the AS.6’s, utilizing two intake and two exhaust valves actuated by dual overhead camshafts. The AS.6 and AS.8 shared the same 5.51 in (140 mm) stroke, but the AS.8’s bore was increased .08 in (2 mm) to 5.51 in (140 mm). Reportedly, the AS.6 and AS.8 used the same connecting rods and both engines were started with compressed air. This view displays the four magnetos of the FIAT AS.8 just above the propeller gear reduction. Note the the air distribution valves driven by the exhaust camshafts for starting the engine. The outlet of the water pumps can be seen in the forward position, which differs from the first image on this page. The AS.8 was unusual in many ways. Its two banks of eight individual cylinders were set at 45 degrees. The 16 cylinders gave a total displacement of 2,104 cu in (34.5 L). The cylinders had a 6.5 to 1 compression ratio. The single-stage supercharger was geared to the rear of the engine and provided pressurized air to the cylinders via a long intake manifold between the cylinder banks. The carburetors were mounted above the supercharger. Unlike the AS.6, which used independent coaxial propellers, the AS.8 featured contra-rotating propellers geared to the front of the engine at a 0.60:1 reduction. Two sets of two-blade propellers 7.2 ft (2.2 m) in diameter could convert the AS.8’s power into thrust for the CS.15. The engine weighed 1,742 lb (790 kg). Nine main bearings were used to support the long crankshaft and to alleviate torsional vibrations. In addition, drives for the camshafts, magnetos, and water pumps were mounted at the front of the engine. Each cylinder bank had two magnetos to fire the two spark plugs per cylinder. The distributor valve for the air starter was driven from the front of the exhaust camshaft for each cylinder bank. The exhaust gases of the AS.8 were utilized to add propulsive thrust through specially designed exhaust stacks on each cylinder. For cooling, pressurized water was drawn into a pump on each side of the engine, near its front. A manifold delivered the water to each cylinder on the outside of the bank. The water then flowed through the cylinders and exited their top into another manifold situated in the Vee of the engine. The heated water, still under pressure, was taken back to the CS.15’s tail, where it was depressurized and allowed to boil. The steam then flowed through the CS.15’s wings, where 80% of their surface area was used to cool the steam and allow it to condense back into water. The water was then re-pressurized and fed back to the engine. Engine oil was also cooled by surface cooling in the rear and tail of the aircraft. 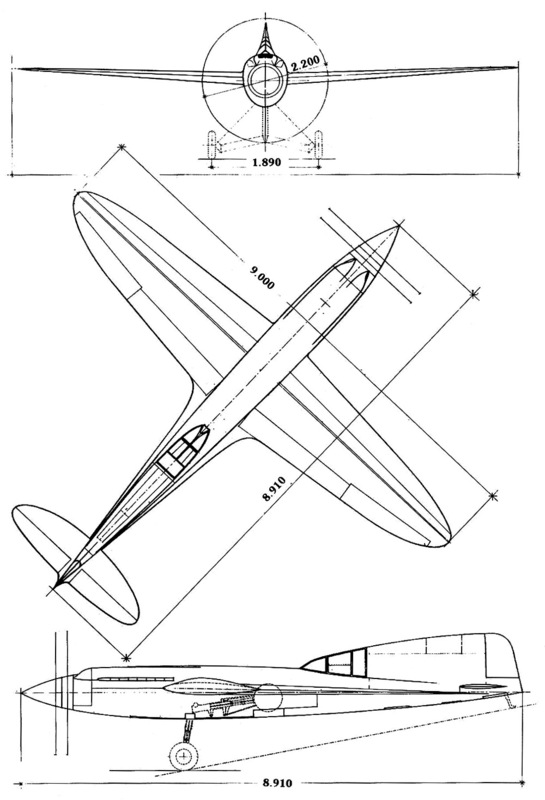 A three-view drawing of the CMASA CS.15 racer. Note the thin wings, minimal frontal area, and main gear retraction. By early 1940, full-scale mockups of various CS.15 components were built and the construction of the CS.15 was underway. Wind tunnel tests indicated the CS.15 would reach a speed of 528 mph (850 km/h). The AS.8 engine was running on the test stand at this time. During these tests, the AS.8 achieved an output of 2,500 hp (1,864 kW), but the engine was rated at 2,250 hp (1,678 kW) at 3,200 rpm. The engine accumulated tens of hours running on the test stand and encountered few, if any, major failures. It is not known how many AS.8 engines were built, but the number is thought to be very small. The AS.8 was also the starting point of another V-16 engine, the FIAT A.38. After Italy entered World War II in June 1940, progress on the CS.15 and AS.8 continued but at a much reduced pace. The CS.15 was damaged in various air raids, and it was further wrecked by the Germans as they exited Italy in late 1943. Some believe that whatever remained of the CS.15 was taken to Germany, as the aircraft essentially disappeared. As for the AS.8 engine, one example survived the war and is on display (or in storage) at the Centro Storico Fiat in Turin, Italy. The AS.8 achieved a power output greater than 1 hp/cu in and 1 hp/lb—accomplishments that were sought after by engine designers around the world. This entry was posted in Air Racing and Records, Aircraft, Aircraft Engines, Between the Wars, Between the Wars on 23 July 2014 by William Pearce.